Afraid of falling behind with digitisation? What is the importance of digitisation for the retail sector and what obstacles can arise for those who own or run a store? How can you benefit from digitisation and also make life easier for the customer? We list five things that digitisation can do for your store! Order your food during your coffee break! Many physical stores already offer the facility to order goods online. This is a way of adopting digitisation, while at the same time offering the physical presence and expertise that is available in the store. Goods that are ordered online are picked in the store and then delivered to the customer, via an order collection point or directly to the home. Ideal for the customer who is short of time or is a long way from the nearest store. 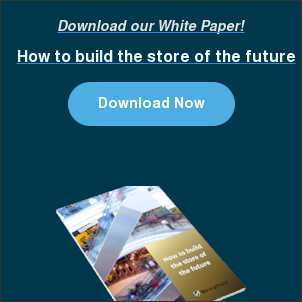 Digitisation makes it possible to gather all information in one place, which in turn helps you to optimise processes and workflows in the store. Using smart software, you avoid paying for the manual processing of information and can instead use resources differently. Maybe by offering more staff on site in the store, or by specialising in a certain product area. Digitisation and fast deliveries require there to be warehouses available in the local area, or at least close enough for delivery to take place the same day. At the same time, digitisation also creates the conditions for making this process possible. With modern systems, you can create a clear overview of stock levels for all warehouses, both locally and further away. This also allows the supplier at all times to keep an eye on which a products to re-stock and how far away the nearest product is. A product collection locker is the solution to “the last mile delivery”, i.e. the cost incurred to deliver the product all the way to the end customer. Product collection lockers work really well for both physical stores and e-commerce, and modern versions also have separate sections with different temperatures. This makes it possible to store both food and medicine, as well as items such as clothing or cosmetics. The lockers are connected to the store’s or the webshop’s product system so that stock levels can be monitored, and also have integrated software for monitoring and security. Some stores already have product collection lockers in the store itself. They use them for goods of high value that can be at greater risk of theft, such as tobacco and medicines. By storing them in a connected collection locker, you always have full control of stock levels and avoid both the risk of theft and manual handling. You can read more about how to boost your business by combining digital with humanity here.